I'm a sucker for a girly outfit. While I don't believe in the commercialization of Valentine's Day, it's never stopped me from getting all dressed up! I don't expect any flowers or any gifts, but a good card never huts! I think we need to embrace what Valentine's Day is and show love every day. Do we need one day to remind us who we love? My family is my valentine every day, all year round. I try to remind myself of that everyday when I wake up in the morning and see my son's beautiful face. Last year was his first Valentine's Day, and we spent the day driving around the city handing out flowers to some special people in our lives. He probably doesn't remember the snow storm and the hours spent in traffic cause he was sleeping through most of it, but I remember how happy it made me just to do it. This year I plan to do the same with him. Rather than choose one person to be his valentine, he will have many who he will share it. It's a tradition I want to start with him and as he gets older, I'll see how he embraces love with others. I did a cute shoot with my hubby much to his silent grunts. I can't wait to show you my shoot with my son in the next couple of days. Be kind and love openly. Thanks for sharing your look with Visible Monday! This outfit is adorable! I love the red skirt with this striped top. Great mix of dressy and casual. I love this! I saw this sweater a few weeks ago and almost bought it. Now I am mad at myself for not buying the thing because it looks so adorable on you! How cute are you guys! Love the cheery Valentine's outfit! Your outfit is simply amazing! I love those hearts on the shirt as well. One question though, I was freezing just looking at you; were your legs not freezing? Lol! Thank you for sharing at Motivational Monday Link Party! Hope to see you again Sunday night. These photos turned out so nice....even if he wasn't too excited about taking them. haha! So sweet! Love your outfit! What a great idea! I love that you did that with your son, that is a perfect Valentine's Day activity <3 and love love your outfit, it makes me so happy! I just love this! Adorable hearts on your elbows, and I love the bright red. Aww. Great pictures! I love all of the shots, you look lovely in red as well. Very pretty look and sweet romantic pics! Stop by tomorrow to link up with Fun Fashion Friday! I'm glad I'm not the only one who dragged a significant other into blog photos. You both look adorable! I know, right?! Wouldn't be as fun if we didn't drag them along! LOL! These photos are beautiful! My hubby and I feel the same way about Valentines and have always agree to just exchange cards. So cute!! Love your skirt!! Thank you so much! For $17 I thought it was perfect! 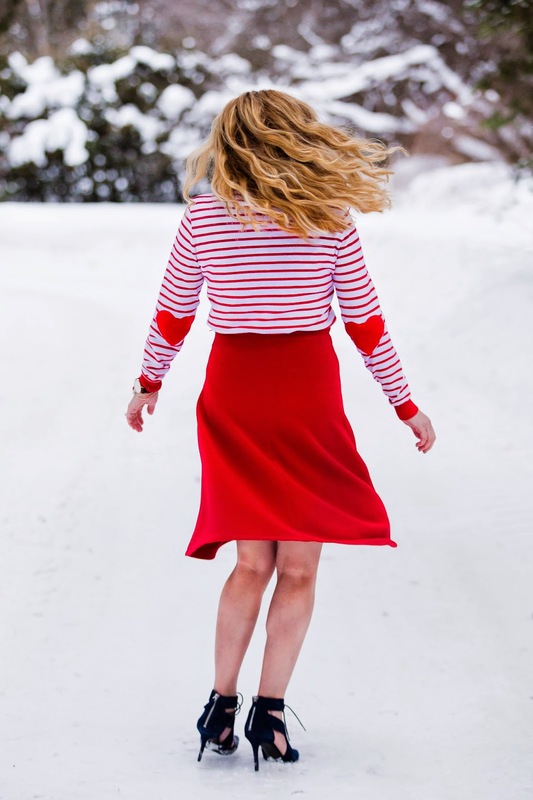 I love this gorgeous photo shoot and your fun red stripes with the heart elbow patches. What a great tradition to start with your son! My husband and I had a date night on Friday, but Saturday I loved spending the day with both of my Valentines, my husband and my son. Red is definitely your colour.. and snow!! What a beautiful backdrop. It a hot Summer day here. I wishing for a hot summer day! LOL! Woah!! you look gorgeous in red. Nice photography.